Has anyone attempted this? I feel I have the skill to do this myself but any tips would be appreciated. If you have a DIY vid for the VQ35HR I certainly would appreciate it. I realize it's a timing chain driven pump and what it's going to take but any pointers would help. Just download the G35 service manual and follow the step by step instructions. What's the story behind this? Your water pump is shot? 10-4 I lifted her up and can see the drip from the weep hole under the block. Pretty sure the seal is leaking inside. I have to fill her up about a gallon every three days. Same thing happened to my 95 Maxima back in the day. Coolant leaking from weep hole. I'm sure the water pump was fine but the seals weren't. 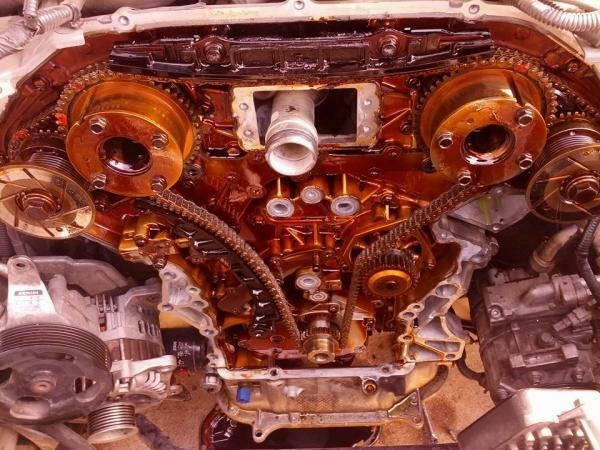 Replaced the water pump and put in a new timing chain tensioner. Not fun but certainly doable. This is super concerning! Props to OP to have the confidence to knock it out. Can I ask what mileage you're at? I got the impression that this motor w/the timing chain etc was pretty much maintenance free beyond regular oil/filer changes, plugs every 105k miles, and regular upkeep within the average lifespan of the vehicle. That's what the service manual indicates too. Gosh dangit. Last edited by DFWG35driver; 11-04-2013 at 02:39 PM. Its not necessary to remove TC cover for water pump replacement. TC has removable access covers for that very purpose. rotate crankshaft counter clockwise to take slack out of chain. Use 8mm bolts to jack pump out. Replace Pump O rings and reinstall in reverse order. Last edited by HotRodG35; 11-06-2013 at 11:06 AM. Just throwing this out there but are we sure the timing cover doesn't need to come off on our V36 sedans with the vq35hr? It appears the previous posts are referring to the prior gen vq35de's. I wouldn't think they'd be much different but who knows. engine design is similar, so I'm sure that procedure is quite the same. Engine does contain same amount of covers in the front.